The Manufactures and Liberal Arts Building was located at the East end of the Midwinter Fair's Court of Honor. Designed in a Moorish style, with California Mission features, the building was 462 feet long by 225 feet deep, and contained approximately 3 acres of exhibit space. 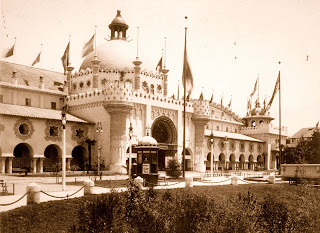 Architect Arthur Page Brown, who also designed the fair's Administration Building, created the largest exhibit hall ever constructed in California up to that time. The exterior featured Romanesque style arches along a cream-colored front facade, with small towers at each end, all capped with red Mission-tile roofs. A central pavilion, with castle-like turrets and a great Arabic style doorway, was crowned by a roof garden and a large turquoise blue dome. The main exhibit hall featured an immense arched roof of glass & steel. Immediately in front of the building was located the Electric Fountain. 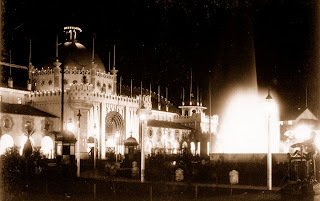 Operated by an underground control room, containing pumping equipment and powerful electrical lighting, the fountain was capable of throwing jets of water up to 90 feet in height, and was illuminated in a rainbow of colors at night. At the end of the exposition, the Manufactures and Liberal Arts Building was demolished, and eventually the Goethe & Schiller monument was placed approximately where the entrance to the building once stood. The Electric Fountain was also removed when the fair ended, and is now the site of the Francis Scott Key monument.